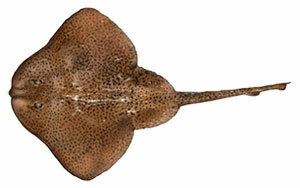 The two skate species that occur in New Hampshire’s coastal waters (the winter and little skates) are so similar that few anglers can tell them apart. They are, however, easily distinguished from other saltwater species by their flattened bodies and large wing-like pectoral fins. Skates are caught year-round both from shore and from boats fishing in offshore areas, though most landings occur in spring and early summer.